Few monuments from antiquity have come down to us unaltered or unharmed. Just yesterday, 24 August 2015, the world learned that ISIS blew up an important monument of the Classical era: the Temple of Baal Shamin in Palmyra, Syria. In Egypt, in the arid and rocky wilderness of the southern Sinai Peninsula, rests a living link to Byzantine emperors, fourth-century pilgrims, third-century Christian hermits and Moses. The Monastery of St. Catherine of Alexandria is a major repository of the early church’s cultural and spiritual heritage. Deep behind its sixth-century walls, the monastery’s monks — who form the smallest of the churches in the Orthodox communion of churches — revere and guard thousands of rare manuscripts, codices, icons and liturgical objects. Many of these precious relics date to the time of the church fathers. In the last few decades, especially as the enemies of civilization target its patrimony, there is a renewed interest in St. Catherine’s and its position in the ancient Christian East. Sinai’s monks have shared their treasures, loaning parchment and painted wood to museums throughout the world. And record crowds, surprising even the experts, have responded, waiting in long lines to view ancient relics once preserved in an isolated oasis lost in time and sand. Scholars have flooded the monastery, studying its manuscripts and digitizing their pages. And tourists, thanks to daily bus service from Cairo, challenge the monks in their efforts to preserve their ministry from commercialization and economic exploitation. Click here to learn more about the monastery, its monks and miracles. Catholic aid agencies having been using various counseling techniques, even a live clown and puppets, to help the Gaza Strip’s children overcome the trauma of lost loved ones and homes in the year since the cease-fire ended the conflict. But they warn that only a political solution can hope to remedy the increasingly desperate situation there. “Almost everything we do as an international nongovernmental organization — and most peers would say the same — is like putting a Band-Aid on a pretty serious injury,” said Matthew McGarry, Catholic Relief Services’ country representative for Jerusalem, West Bank and Gaza. McGarry and other aid officials told Catholic News Service that the long-festering conflict between Israel and Hamas, which runs the Gaza Strip, has created a man-made humanitarian and psychosocial crisis that politics alone must solve. “It’s cumulative. Children as young as 7 have lived through three wars in the past 7 years — that’s your lifetime,” McGarry told CNS of the psychological toll Gaza’s multiple wars have taken on its youngest residents. The U.N. estimates that at least 370,000 children in Gaza need psychosocial support following last summer’s war, which cost the lives of more than 2,250 Palestinians, 65 percent of whom were civilians. Sixty-six Israeli soldiers were killed, along with six civilians, it said, before the 26 August 2014, cease-fire was reached. But Catholic aid officials who regularly assess assistance on the ground called the U.N. estimate “low.” McGarry and Sami El-Yousef, regional director for Palestine and Israel for the Catholic Near East Welfare Association, said everyone in the war-torn strip is traumatized and needs psychosocial support. Still, Gaza’s youngest appear to bear the hardest and most-lasting consequences of the seven-week conflict, according to findings by Save the Children, based in the United Kingdom. Three-quarters of Gaza’s children experience unusual bed-wetting regularly, while 89 percent of parents said that their children suffer constant feelings of fear, reported a study issued by the group in July. More than 70 percent of children worry that another war will break out. Seven out of 10 children interviewed now suffer regular nightmares. For the past year, CRS, CNEWA and Caritas have worked with local partners to tackle these problems. “The program we designed was to reach mainly children, but not exclusively,” El-Yousef told CNS. CNEWA’s psychosocial support became its biggest program to aid post-conflict Gaza, helping more than 20,000 at some 30 schools and other community spaces. “Some recreational activities were involved, but others needed deep psychological follow-up with specialized counselors, including the transfer to institutions qualified to handle severe cases on a one-on-one basis which were detected during the intervention,” El Yousef said. A combination of group and individual counseling, puppets, play and art therapy has begun to show some signs of lessening the trauma. “I was talking with a mother the other day about her 10-year-old daughter, who had been wetting the bed every night and had to be put on anti-anxiety medication by her doctor,” McGarry said. The girl was enrolled into one of 17 child-friendly spaces CRS has set up in Gaza’s towns hardest hit by the bombardment. There, children draw and paint, play games and talk about their feelings. The CRS country representative recounted another case of a 12-year-old boy who was acting out violently and being overly aggressive at home. CRS introduced puppets for the first time in Gaza as a way to encourage children to express their feelings, work through the trauma and adopt nonviolent conflict resolution practices. So far, 3,000 children have participated in such programs, and more opportunities are planned for them next year. Caritas Jerusalem has expanded its help beyond psychological staff visits to families and schools. From July until October, Marco Rodari, an Italian clown therapist, is helping healing hearts in Gaza. Experienced in working with traumatized and sick children, Rodari has created a special program for Gaza’s children. First, he develops a relationship with children through a comedy and magic show. Next, they become the clowns or magicians performing the tricks. The third aspect of the program will be the start of a “real school of magic” for the children. Clown therapy enables the traumatized child to forget for a while the horrors experienced, to feel happy emotions and smile again, Rodari told Caritas. ISIS has reportedly destroyed another significant landmark in the ancient city of Palmyra, Syria. The Temple of Baal Shamin stood for nearly two millennia, honoring the Phoenician god of storms and rain, as the BBC reported. Destruction of the site would be directly in line with ISIS’s campaign not just against people of other faiths, but against their culture. “Oh Muslims, these artifacts that are behind me were idols and gods worshipped by people who lived centuries ago instead of Allah,” one militant said of antiquities in Mosul, Iraq, earlier this year. After the ISIS captured Palmyra in May, Baal Shamin seems to have fallen to the group’s philosophy. The Maronite Church is not known for its architectural achievements, artistic wonders or musical treasures. Driven into the peaks and valleys of Mount Lebanon — a mountain range stretching along the eastern Mediterranean — the Maronites’ greatest accomplishments are perseverance in the faith, the unique relationship forged between patriarch and people, and their role in the creation of modern Lebanon. The fortunes of the Maronites are often tied to those of Lebanon; to separate either of these symbiotic entities would do neither of them justice. But equally inaccurate is the suggestion that to be Maronite is to be Lebanese, or vice versa. Some 10 million Lebanese live elsewhere, in Africa, the Americas, Asia, Europe and Oceania; as many as half are Maronites. Maron died in 410. Carrying with them the skull of the revered priest, his disciples — known as Maronites — formed Beit Maron (Syriac, meaning “house of Maron”), a monastic community near the great city of Antioch. There, the Byzantine Emperor Marcian sponsored the construction of the monastery, which was dedicated in 452. The development of the Maronite community coincided with the great debates rocking the early church in the eastern Mediterranean. And as the church, particularly in the East, became intricately linked to the imperial Byzantine state, the positions assumed by competing parties took on political overtones. The early Maronites were Hellenized Semites, natives of Byzantine Syria who spoke Greek and Syriac yet identified with Greek-speaking Constantinople and Antioch. Where were the monks of Beit Maron in this political, social and theological upheaval? Little evidence remains. What has survived has triggered more than a century of debate among historians, particularly in Maronite circles. The general consensus, however, concludes that the Beit Maron community, as loyal subjects of the Byzantine emperor, accepted the decrees of the ecumenical councils called by the emperors to bring unity to church and commonwealth. They implemented them among the local Syriac-speaking Christian community, forming the nucleus of the Maronite Church. The Arab Muslim annexation of Syria in the mid-seventh century altered the position of the Maronites. With contacts with Constantinople severed, Antioch in Muslim hands, and its ecclesial situation in disarray, the monks of Beit Maron elected one of their own as patriarch of Antioch. Tradition has it this first patriarch of Antioch of the Maronites, St. John Maron, was elected in 685. Bands of Maronites soon began to settle in the northern reaches of Mount Lebanon, where they established autonomous communities and formed alliances among themselves while pledging fealty to the patriarch. They tenaciously defended their autonomy, repeatedly attacking Arab positions and harassing Byzantine scouts eager to retake the area. Ironically, the Maronites flourished despite the destruction of Beit Maron in the ninth century and the relocation of the Maronite patriarchate to a monastery near the coastal town of Batroun. In the peaks and valleys of Mount Lebanon, the Maronites terraced the difficult terrain, tilled the soil, planted olive trees and fruit trees and cultivated vineyards. Maronite holy men and women, like their hermitic predecessors, lived and prayed alone, carving hermitages in the rock, inaccessible to predators but accessible to those seeking counsel. Thus for more than two centuries the Maronite Church endured in mountainous isolation. 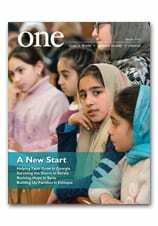 Read a full account of the Maronite Church from ONE magazine here.